Welcome to Cooking With Cricut's Monday Cartridge Showcase. 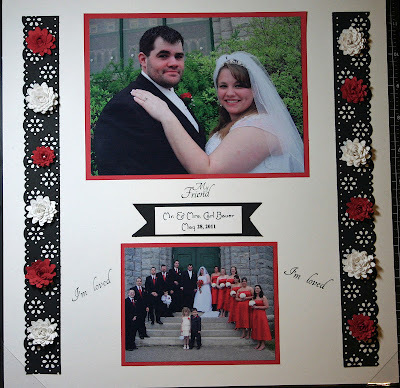 Today Chef Linda is taking over the blog and sharing one of her favorite Cricut cartridges . . . Flower Shoppe. These gorgeous, multi-layered flower designs open a bouquet of possibilities. On this cartridge, you’ll find the perfect floral accents for your cards, frames, wreaths, and more. So without further ado . . . here's Linda! I could not wait to sign up to showcase the Flower Shoppe cartridge. From the day I bought this cartridge, I was hooked on flowers! This is such a fun cartridge to play with, you can cut up a bunch of them and just sit in front of the TV, talk on the phone and just roll away and make beautiful flowers. Here is a picture of what you can do when you are on the phone a lot for work (work at home), it is a great stress reliever! LOL! Everyone was amazed at how beautiful the wishing well came out! My niece also got married this past year. Her colors were black, white and red. So I wanted to create an elegant layout with her colors. And of course, what would a card be, without flowers?? 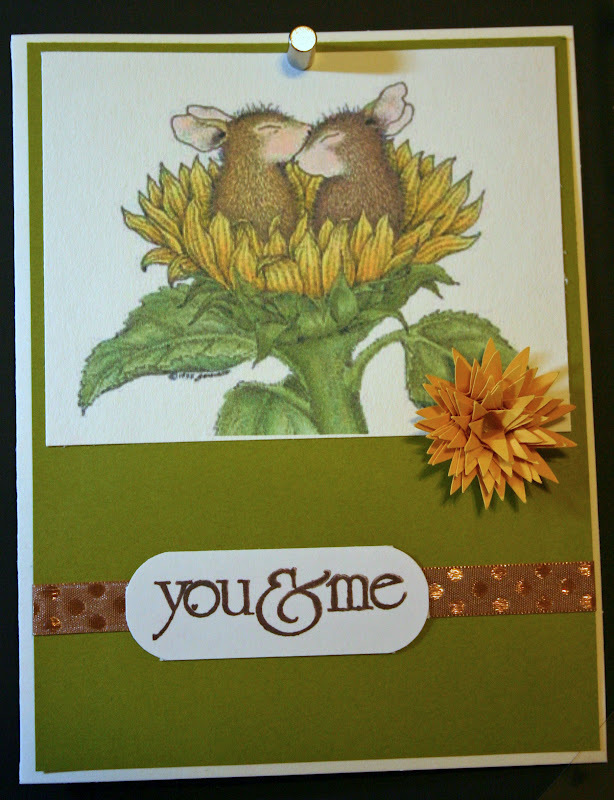 I made this card with a House Mouse image and accented it with a medium yellow flower, which made the perfect accent. Can you tell I just love this cartridge? If you have not bought this cartridge yet, it is a definite must have. Great projects, Linda! That wishing well is simply amazing! Make sure you head over to Linda's blog -- leave her a comment and let her know how much you liked her showcase today. We have another great challenge lined up for Wednesday and Chef Debbie will be sharing one of her favorite cartridges on Thursday. Thanks so much for stopping by today! Oh My Goodness Linda! That jar of flowers is a crafter's dream! What a fantastic way to multi-task! I LOVE your idea for the wishing well. I have the same one and haven't done a thing to decorate it! Thank you for the wonderful inspiration! Thank you for being a major enabler. This one cartridge I hope to get some day soon! Linda your flowers are gorgeous. 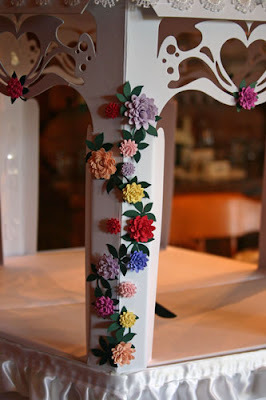 I love making flowers too. The wishing well is adorable. Those little bright flowers really add a lot. The layout and card are very cute also. Thanks for sharing. Oh my, Linda. 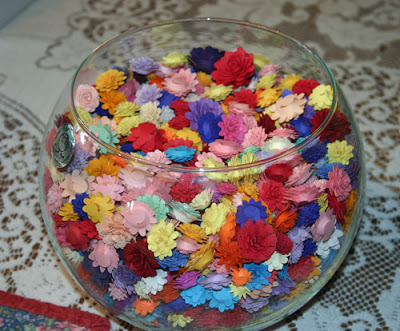 Wonderful projects and look at you with a bowl full of flowers - amazing. Your wishing well is a work of art. Thanks for sharing your wonderful ideas. 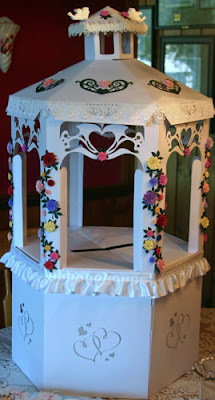 Wow Linda, I do not have this cart but am amazed at the beautiful projects you made...makes me want to go buy it TODAY! Great showcase! Ooh, I DON'T have this cart, but I absolutely love what you've done with it. Will definitely have to check it out. SOON! I am so jealous of your bowl-o-flowers! I have this cartridge and I think it's one of the best investments! There are so many different versions you can make with it. You have inspired me to cut and have them ready to roll!